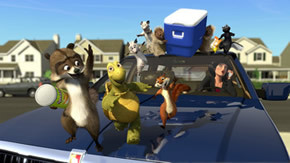 Publicity Stills of "Over the Hedge"
Based on the popular comic strip by Michael Fry and T Lewis, “Over the Hedge,” centers on the unlikely friendship between a worldly and mischievous raccoon (Bruce Willis) and a timid turtle named Verne (Garry Shandling). When R.J., Verne and their woodland friends find a suburban housing development encroaching on their forest home, Verne’s first instinct is to retreat into his shell and leave. But the ever-opportunistic R.J. sees a treasure trove to be had from his unsuspecting new neighbors. Together, Verne and R.J. as they learn to co-exist with—and even exploit—this strange new world called suburbia. The animals are invading the theatres! 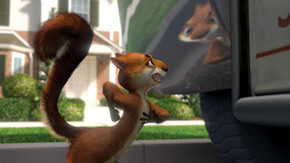 This year seems to be the year where animation turns the spotlight on animal characters, and Over The Hedge probably set the bar for the upcoming movies like Happy Feet and Open Season to beat, given the dismal effort of the clone of DreamWorks' Madagascar - The Wild, shown earlier this month. The first scene probably took the opportunity to subtly jab last year's overhyped Chicken Little, as a reminder that a decent storyline is necessary to sustain audience interest. Based on the comic strip by Michael Fry and T. Lewis, Over The Hedge will benefit from having a ready made audience to tap into. However, with the strengths of the movie, it'll bound to win over some new fans for the original source material. RJ the raccoon is a loner, self-centered, and driven by the sole motivation of self-preservation. Having owed the bear the load of food which he stole, he has 7 days to make good, or risk losing his life. He chances upon an animal family misfits of sorts, and convinces them that the grass on the other side of the hedge, is greener, and tries to make use of them to achieve his goal. 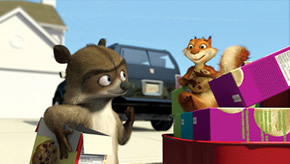 The strength of Over The Hedge lies in its characters. No doubt you'd come to expect certain predictability in the way some of them will change over the course of the movie, it's the way that it's delivered, that makes it satisfying. You can't help but fall in love with one of them at some point in time, be it the cavalier attitude of RJ, the speed demon squirrel Hammy (whom I suspect will be a firm favourite), or the timid, principled, don't-rock-the-boat turtle Verne. Other animal characters include the skunk, the porcupine family, as well as Possums, which are getting quite popular for animated flicks. Besides the characters, the movie explores very quickly on themes like urban development, suburban living, and very subtly, the need to conserve, not wiping out animal colonies that live in the natural habitat which we take over in the name of development. Friendship and family are powerful themes that take the centre-stage, as do more negative ones like selfishness and jealousy. At times though, the relationship between RJ and Verne remotely resembled that of Woody and Buzz, from Pixar's Toy Story, with one feeling threatened by the arrival of the other, and struggles to seek the (continued) acceptance from existing friends. Surprisingly, there are only 3 songs in this movie, departing from the usual load of song-and-dance routine which peppers many animated movies. And one of which stood out, was a montage sequence which had a satire on us humans, our approach to food, and our sedentary lifestyles. It doesn't lack in its offering of humour, ranging from slapstick to dry wit and word play, ensuring that there is something for everyone of all ages. The animation is top notch. Watching it digitally brings out the clear crisp quality of the animation, so you might want to pen down that reminder. 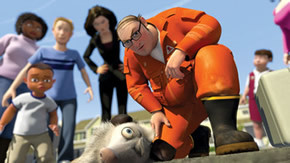 Adding zest to the drawings and bringing the characters to life, also boils down to the stars which Over The Hedge had, with vocals provided by Bruce Willis, Garry Shandling, Steve Carrell, Nick Nolte, Eugene Levy, Catherine O'Hara, Thomas Haden Church, William Shatner, and even Avril Lavigne, amongst others. 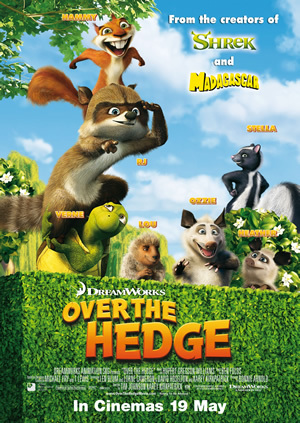 Over The Hedge doesn't overkill with its cinematic spoofs (and this makes it a refreshing change), but perhaps can lay claim to the largest explosions ever in an animated movie, in a tongue-in-cheek fashion of course. As always, with most animated offerings these days, stay tuned until after the end credits roll.